The new version of Maptek Vulcan is out. It seems like the last update was just here and in reality it kind of was. Maptek Vulcan 8.2.1 was released on 2 May 2013. It has been less than two months since the last release. This faster turnaround time means less waiting for the upgrade that has been bugging you, and hopefully more time using a great version of Vulcan. I got two of my bugs fixed this time around. Despite the faster release cycle Maptek still managed to fix or upgrade 90 different items for release 8.2.2. One notable thing that wasn't fixed for this version was a Vulcan crash. I read all 90 points on the release notes and none of them sounded like they were implemented to fix a Vulcan crash. Of course, Maptek never comes right out and states that they fixed a crash. They usually try to phrase it like something that is slightly less sinister. They’ll say that they fixed a function that ‘caused Vulcan to close unexpectedly,’ or that they corrected ‘an unexpected termination of Vulcan.’ In any case this is the first time that there haven’t been any crash fixes in a service pack release that I can remember. Let’s hope that there really aren't any known issues that cause Vulcan to crash. Import > Whittle 4X – added support for spaces in block model names when importing Whittle 4X files (this one is mine). Several years ago Vulcan made a big move away from the Fortran programming language. This was supposed to allow spaces in filenames and pathnames. In reality, I still run across places from time to time that still require the no space protocol. This is becoming more and more frustrating as spaces in filenames become more common. It was nice to see a short turnaround time for updating this option to meet current Maptek standards. 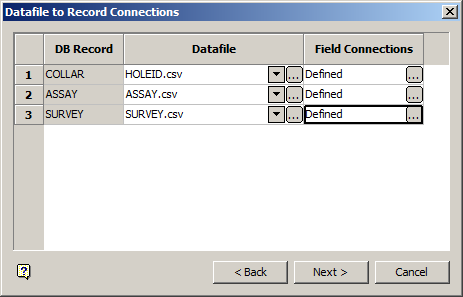 Details > Polygon Area – a single error message is displayed if the area for multiple objects cannot be computed. I’m sure this isn't the last time we will see a similar fix in Vulcan. The original problem was created when the user selected multiple objects in Envisage and then used the option. Vulcan would create an error panel for each object that had been selected. If three or four objects had been selected, this was no big deal. If several thousand objects had been selected, this was a big problem. I remember when someone at Maptek showed me how to use my stapler to hold down the ‘enter’ key until the error messages went away. I’m always glad to see things like this get fixed so users don’t have to use the stapler workaround anymore. Triangle Utility > Foot Print – Added a new option to return a polyline of a triangulation’s outline in plan view at a given elevation. This option seems really neat. I have wanted a way to get the outline of a solid in plan view for a long time. I wish that this option had a few more additions. It really needs some naming options i.e. set the object name to the triangulation name. I also wish that there was an option to set the elevation of the polygon to something relative to the triangulation. The max or min elevation or the average elevation.By far the biggest problem with this option (besides the fact that it was released without being included in the help) is that it only works for one triangulation at a time. Software that is intended to make the user more productive should really be designed to work with multiple pieces of input data. Triangle Surface > Add Vertex/Delete Vertex also Insert Triangle/Delete Triangle – Added the option to save an edited triangulation as a new triangulation. This is an important fix because triangulations are separate files. Once they are overwritten there is no undo function. Most of the other triangulation functions give the option to save as a new triangulation instead of overwriting the original by default. If there are any other Vulcan triangulation options that don’t have this fix they should be given high priority. Compositing > Compositing – Resolved an issue in which unordered tables were deleted when an Isis database assay table was not sorted by the field table during compositing. This is probably the most disturbing fix. I’m pretty sure that anyone working with the Isis databases in Vulcan would be extra careful if they knew that a sorting error could cause the offending tables to be deleted. Worse, how many Vulcan users have had tables deleted and don’t know it yet. If you need one big reason to upgrade to Vulcan 8.2.2 here it is. Open Cut Design > Pit Topography – Added the ability to assign a name to an intersection polygon (also mine). The intent of this fix is so that when the user creates progress maps the intersection polygon will already have a consistent naming convention. The folks at Maptek must have misunderstood what I wanted because instead of having an option to specify an object name or giving the polygon a default name (like INT) the option now gives no object name to the intersection polygon. This doesn't help. In fact, I see no difference between this and version 8.2.1. I complained to Maptek about this tool not working in the new version and they were kind enough to tell me that this was really coming out in version 9.0. They then emailed me a copy of the 'official' release notes. Apparently, the release notes included with the actual version don't count as the 'official' version. Too bad that the 'official' version of release notes is hidden behind the firewall of the Maptek Users' area. Triangle Solid > Split – Added a tool to automatically split separated objects in a triangulation into individual triangulations. This tool is also mislabeled by Maptek. This should really read: Triangle Solid > Auto Split. The tool should really come with more control over the naming options and have at least some representation in the online help. I’m sure that I wasn't the only one who complained about the bug logs that were fixed but it makes me feel good to know that some of the issues I reported were fixed in this release.